If anyone wants to join in for a somewhat scenic season closer, come by this Friday! Meet at the Tims at 120 Ottawa St. N for 4:45 with KSU 15 mins later. If you can't get off work that early, we are having a second meet spot in Guelph at Tims(486-488 Woodlawn Rd E) for ~5:30. And as a bonus, the Guelph stop is near my house - I just might be there! Thanks for putting this together, Sebi! If anyone wants a cheap wheel chock, check out this thread. I've done Jennings a couple of times. It's great. Plenty of Canadian racers do a pre season test there. Weather starts getting decent there usually late Feb or early March. It is a bike only track, cars don't chew up the surface because they're not there. Closer to home, over the years, I've done Grattan, Gingerman, Putnam Park, Mid Ohio, Road America. It's getting to be quite a while, though. I haven't been to Grattan since the race organization that I was a member of at the time, closed up at the end of 2002.
Who has experience buying a bike in the states? I'm thinking of picking up an mt09 or the mt09sp and am considering buying from down south. Is it a pretty easy process? Anything to watch for? Both the CBR and the R1 came from the US. There is a bit to it, but if you are organized, its actually straight forward. - If the bike does not pass federal inspection it must be returned to the US. - There is a 72 hour period before you can import. They are pretty rigid on this. Can only be done M-F, weekends don't count. Its a chicken and an egg problem. You can't export the bike until you have the title, and it is unlikely someone is going to give you the title without receiving money. You probably don't want to pay for a bike and not take it with you from some random person. You can store it at places like CBI, but its another layer of headache. - The US does not have a centralized lien system like the MTO. Absolutely be sure you pay the $10 USD for a vin search. I can dig up the place I used which was good. I could not believe how many US bikes had liens. You must have a clean title to import. Thanks for the detailed info. It helps hearing other people's experience with it. As far as going for a base MT09 and upgrading to Ohlins rear vs buying MT09 SP with factory Ohlins, I've heard in a few places that factory Ohlins is never quite as good as aftermarket Ohlins you can pick up. Is it typical that manufactures stick a lower tier Ohlins model just to have their name on there? Any experience with that? Are you thinking of buying new or used? I bought a new CBR1000 in 2013 when the exchange rate was good enough to make it worth it but it is difficult to find a dealer that will sell to a Canadian. They have rules that you need a US address and proof of residence but some dealers are willing to work around that. Otherwise, like Randy said it's not difficult - just be organized with your paperwork and planned times for border crossing. 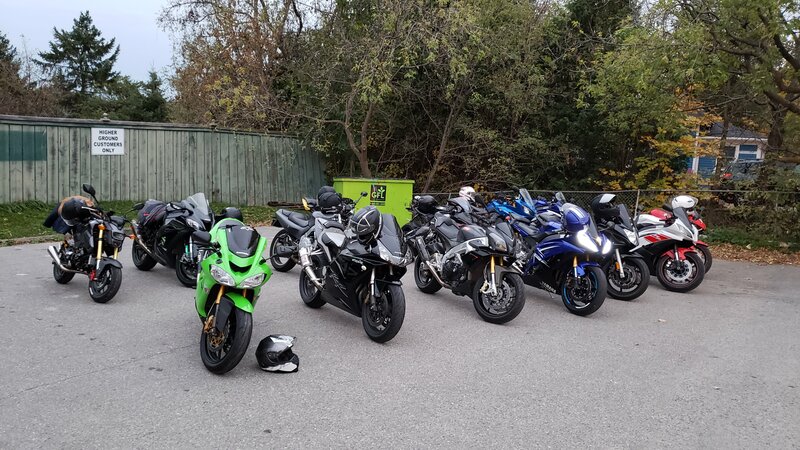 First little pre-season ride from this past Friday! Season opener will be coming up soon, hopefully this upcoming weekend. It is time to come out of hibernation, forecast for this Sunday is 16° and sunny! We will be hosting our official KSR Season Opener to kick off the season. 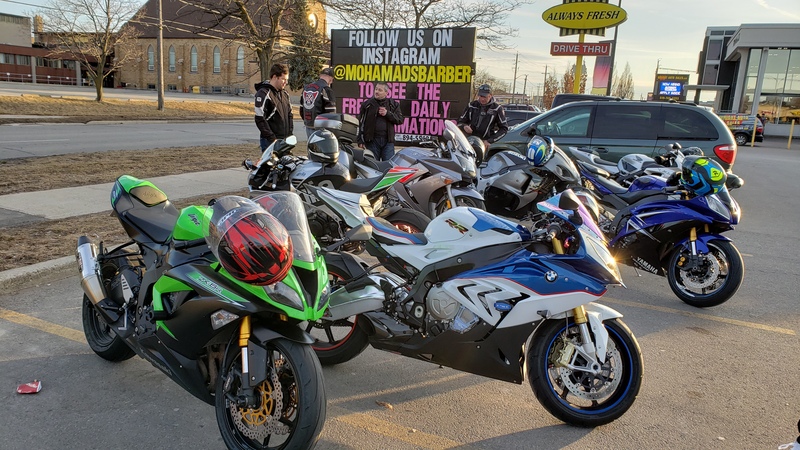 If you haven't made it out to any rides last year, come meet the group and join in on the fun! After the ride, we'll be stopping at St. Louis for some food/drinks. Pace: Slow cruise, no shenanigans. Roads are cold/messy. See you all out there; hope to see a bunch of new faces! BUY SID FOR SPEED'S COMMEMORATIVE 1000TH POST EDITION T-SHIRT TODAY ! Just signed up for the Facebook group. Will try to make it out Sunday. I've accepted your request for the group. Under the announcements tab, you'll find a post with everyone's bikes. I've also added you to the 2 chat groups we use. Also, you can get the seller to get the ITN number for you, but I just paid the $35 to AES that way I knew it was done right. Thanks. Haven't done a GTAM group ride in a couple years. Looking forward to reconnecting now that I'm an empty nester. Just wanted to confirm the ride for tomorrow. All original details have remained the same; we also have St. Louis booked at 5:30. Meetup is at the Tims at Ottawa/Weber for 3pm, KSU 15 mins after.